The device I am pleased to present is a classic powerbank. 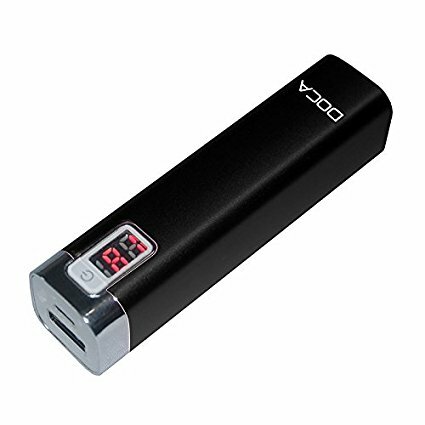 It has a small capacity of just 2600 mAh. It was built not to repeatedly charge your phone, but its main function is that it has in emergency situations, provide enough power to handle the most needed issues. Because it has a small capacity, it is very small and light. This mobile charger, when hidden in a backpack or purse, is not quite noticeable. Its small weight and dimensions, that wherever you put it, you will not feel it. It's less than 150 grams. The device is less than 10 cm long, so you will not feel uncomfortable when it comes with it. The device is equipped with a digital display that informs the user of the current power level. This is a very reliable and reliable way of controlling. You always know how much energy you have. The energy bank with such parameters is designed for emergency situations. If you are a person who has a lot of work to do, you've probably met the situation when the phone was unloaded, and there was a need to do a few things. Take care of your mental comfort, protect yourself from unnecessary stress and use portable chargers. You met a pretty girl, you've known me for a long time. You like it. It cost you a great deal. You finally succeeded, she agreed. For a few nights no longer write, you are waiting for that day. In the end, you go to a coveted date. Unfortunately, on the way to it the bus is broken. You really care about this girl and you want to let me know that you're late for your fault. Unfortunately for anger, you look and your phone no longer has power. You are very upset because you really care about this girl. If you had a powerbank with even a 26000 mAh capacity, there would be so much nerve. It is really worth protecting yourself against such events.